Just to clarify: the errors and issues being encountered are with PMC and turned prisoner militia, where their profiles are being incorrectly created. Not sure if you tested with these functions, as I've yet to compile and play the latest trunk. Hmm. As you've discovered, there was a mix up between soldier class and militia level. I'm not sure why, because at some point I was aware of that exact issue and used conversion functions. Weird. Anyway, fixed in r8477. This also fixes any ranks when loading an older savegames, of course. 1. Bug Report: I trained militia in Chitzena. When viewing the Militia Overview website, it says that I have militia in Drassen (B13 & C13). I have not yet taken over Drassen, so that can't be possible. I also interrogated a prisoner and he defected to me. I disbanded him and the possible error message appeared ("POSSIBLE ERROR: NOT ENOUGH INDIVIDUAL MILITIA FOUND IN DISBANDINDIVIDUALMILITIA"). After disbanding all militia and dismissing all mercs, I confirmed that I am still paying for the militia which don't exist. 3. Advance time until 09:45. Read Enrico's email and open the Militia Overview Website. Sort by location and note the militia in Drassen. Close the laptop and go to the Strategic view. Enable the militia filter. Click on Chitzena and disband all militia. Note the error message. Dismiss Spike. Note the Daily Expenses remain above 0. I've fixed the appearance of that error message in r8493. But the militia profiles in Drassen already exist when one loads the savegame (it says they were trained in Drassen on Day 1, 16:00). I'm not sure where they come from though. As we completely wipe our individual militia every time we load a savegame, I don't think this could be some sort of saving/loading issue. Do you have another savegame from, like, a different campaing where these guys existed? But the militia profiles in Drassen already exist when one loads the savegame (it says they were trained in Drassen on Day 1, 16:00). I'm not sure where they come from though. As we completely wipe our individual militia every time we load a savegame, I don't think this could be some sort of saving/loading issue. Do you have another savegame from, like, a different campaing where these guys existed? 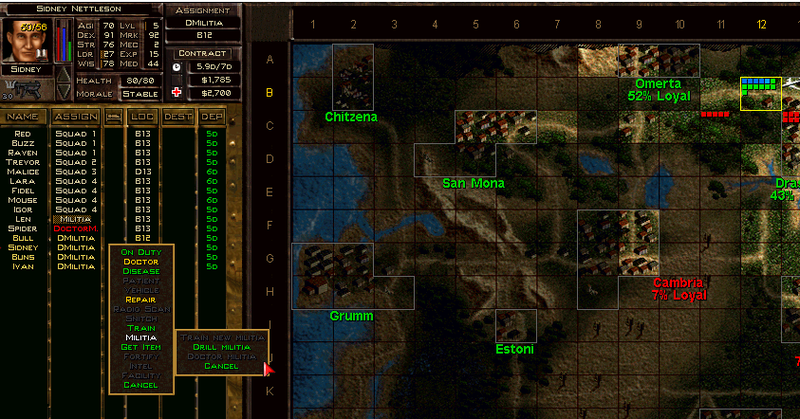 I started a new campaign using 8488 game dir 2391. However, I saved over a previous saved game from an older campaign. I did not realize that overwriting a previous save would some how mix up the individual militia profiles. How does that work exactly? If it helps with your analysis I have uploaded that other saved game to dropbox along with the INI (I happened to back up files prior to overwriting the save). Note that this saved game is from 8473 using game dir 2385. Is there any way to use the origin name generator system for regular enemies? The current profile system is rather rigid, and it'd be much better if Deidranna's goons could benefit from randomly generated, culturally-appropriate names. The admin and army troops could follow the Arulcan standard by default, while blackshirts would have a high percentage of foreign members and therefore names (and appearance, perhaps). They are hired mercenaries, after all. Some players probably remember the time where we still had only a handful of names for enemy/militia profiles and on every encounter we got some "Lachlan "Sir" Botticchio" or another which made me turn the feature off. So instead of removing names which aren't wrong I'd propose to correct the ones that have been written incorrectly and add your new names to increase the number of names. So instead of removing names which aren't wrong I'd propose to correct the ones that have been written incorrectly and add your new names to increase the number of names. I also don't think we should worry about obsolete names, short forms or any exact etnical conformity at all as long there no screaming typos. PMC mercenary are russian-like. While the description I made for Kerberus potentially allows any nationality, I feel that having them immediately stand out from the locals would be good. Additionally, this lets me show off how men and women can also have different surnames. As I understand the only goal here is to create 3 recognisably different naming lists. "Hispanic", "Russian" and "German" therefore are just very broad labels. "Latin" and "Slavic" would probably be more appropriate labels. Or even revert to functional labels as "local", "hired", "army" or some such. But well, tangential discussion about labels is in itself quite... stupid (for lack of better word). Some players probably remember the time where we still had only a handful of names for enemy/militia profiles and on every encounter we got some "Lachlan "Sir" Botticchio" or another which made me turn the feature off. "Sir", "tty" and so on? Yes, I remember this time too (I play 1.13 since 2011). Especially since certain names have been adopted to other countries in their short form as a regular name. I didn't know how wide is it. You are right. "My name is Petya Ivanov" sounds weird to me, but if this is in use in any country, why not. If so, how about adding more short forms for more accordance (by now, some names have their alternative forms, and some haven't, which is a bit selectively)? Oh... If no one will complain, you are right. But these old "Osip", "Lukyan" and so on sound just like Ealdgyth (en.wikipedia.org/wiki/Ealdgyth) or Aescwine. Sorry for necroposting here, I missed the discussion. I actually explained hypocorisms and as Silversurfer said I left them intentionally so non-Russian community could recognize these names. I can add more commonly used Russian names - just let me know if they are needed. The first option does what militia training does: train new militia (or promote existing ones if no more room or volunteers). a normal militia training session requires 10000 points (when training, you see a merc's training points / 10 /maximum training points / 10 on their face). , so we always deduct that money. Can't have one assignment be free while the other costs something, no? Experience is awarded in similar manner for training provided (trainig empty air does not award experience). One important part: This works in any sector, regardless of whether training new militia is possible there, as long as militia that can be trained are present. This only works with individual militia. The third option is new: doctor militia allows restoring militia HP similar to how the regular doctor assingment works. This obviously requires INDIVIDUAL_MILITIA_MANAGE_HEALTH to be TRUE. As you may or may not be aware, individual militia data doesn't directly store militia health points (that would be useless, as militia stats depend on class, game progress and sector). We store their health ratio instead. They already heal INDIVIDUAL_MILITIA_HOURLYHEALTHPERCENTAGEGAIN % each hour, now you can speed that up by doctoring. Of course, given the huge number of militia and their... tactics, that would be a lot of wounds to treat... a daunting task for your doctors. 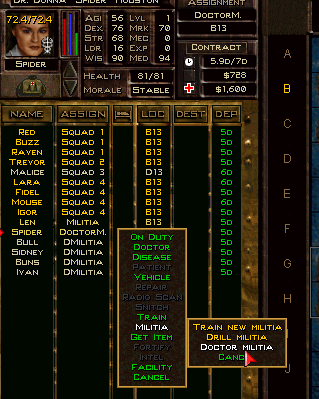 For that reason, you can increase the effectivity of a doctor on that task: INDIVIDUAL_MILITIA_DOCTORHEALMODIFIER determines how many percent one doctoring point heals (for example, stock Spider has 362 points, each normally heals 1/100 of a merc's HP). I set it to 0.2 in stock. To achieve near parity with merc healing (and likely keep all the doctors on the roster busy )use 0.01. Values from 0.01 to 1.0. That value is already applied to a merc's image on that assignment - in the above picture, Spider can heal 72.4% of a militia's HP. This also works in any sector as long as militia in somewhat ruffled condition are present. I hope that this will be quite helpful in making individual militia more useful. One could, say, pack a platoon of FNGs, a few trainers and medics to represent military advisors and LTs, and go to battle with that. @GiantBasher: Your issue was related to the bug above. As some point you moved militia into a sector you had loaded and it duplicated the profiles and orphaned others. The only fix is to load a point BEFORE it happened or restart your game or hex your save file and remove them. You can also set 'Individual Militia' to FALSE in your JA2_Options.ini and then turn it back to TRUE, but they will still be there most likely. @LatZee: I'm not entirely sure how Kerberus gets cheaper. What? @RunAwayScientist: First of, thanks for taking the time to look into issues. I hope I can check it out at the weekend latest. The idea in MoveIndividualMilitiaProfiles(...) was to speed up the loop (we could have hundreds or thousands of profiles and don't want to always loop over all of them). I originally planned to have a separate vectors for each sector, but that seemed excessive. As to the warnings... the idea is to warn the player if something goes wrong (classic sirtech code solves that problem by simply crashing the game with Assert(0);, which is excessive). I mean, if militia somehow have no guns, that is... bad. Hmmm. I'd rather have those warnings at least in debug mode. >does not return an ID if the profile does not exist. Does that compile? Yes. It compiles and runs correctly. This is not good practice, I know, so perhaps you'd prefer a return null or 0? This function does not apparently require a return and terminates normally if no returned ID is provided. Your code is very robust. Nope, this is not required. What ends up happening is that if there is a problem or bug, it *will* create a new militia. This new militia ID orphans the old militia ID. This is how we get duplicated militia with orphan militia IDs that cannot be removed from savegames or dismissed. They are 'ghost' or 'phantom' IDs sitting in a vector. The game counts their salaries and results in a doubling of daily expenses. They *can* be dismissed manually, but this is annoying for the end user. They also /cannot/ be dismissed after their linked actual militia dies or disbands, resulting in stuck 'phantom' militia IDs in the save file that cannot be removed no matter what you do. Yes, I agree. This is good practice. However, a new variable should be used to measure the current computer clock time so that only *1* single debug message should be displayed every 30 minutes, or use in-game time for every day. This would cut back on the spam and still be a useful reminder to the player that they have unarmed militia. For my games: I commonly smuggle in Kerberus militia into ports and docks and move them completely unarmed to reinforce current combat locations where I can give them equipment. This is how I encountered this issue. 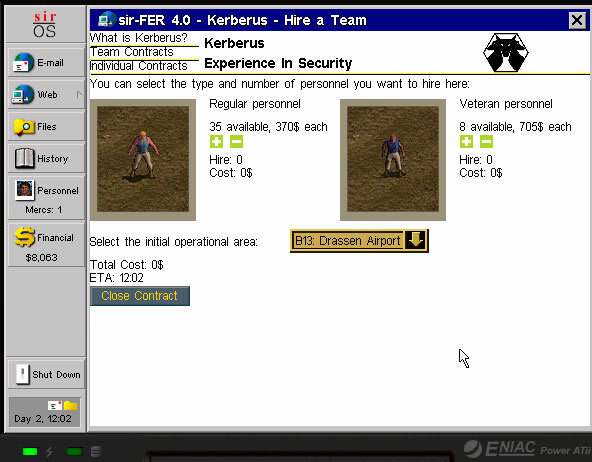 @LatZee: If I understand the Kerberus code correctly, purchase prices are directly related to the settings in MilitiaIndividual.xml ; have you tried modifying those values and then going back to it? After I changed those values, I noticed that the purchase price for my Kerbs went up. I believe it's a hardcoded percentage or multiplier, but this can definitely be modified in the code or through the .xml to match the default prices. I will pay.... a fair price. @LatZee: Ah. That's intended. If we play without Individual militia, there is no way to later differentiate between Kerberus and locally trained militia, so I add a markup that's the equivalent of training cost of a militia of this type times some arbitrary time period. So if we do not find a profile, this militia now has usIndividualMilitiaID 0 which means no ID. This means that this guy has no profile, thus no data will be stored etc.. As a result the feature now only works partially. I get that creating additional profiles is bad, but not creating ones for those missing them is at least equally bad. I guess the easiest (while not satisfactory) solution would be to write a function that loops over all sectors, counts militia, compares that to the 'alive' profiles existing for that sector, and creates new ones where required or culls excessive ones (newest first). Not satisfactory at that doesn't cure the root of the problem, which is new profiles not always being created properly for whatever reason. Eh. You kinda want that warning instantly. Knowing that something went wrong in the battle I've just started is good. Knowing that something went wrong at some point today is not useful. I'll think of something. So if we do not find a profile, this militia now has usIndividualMilitiaID 0 which means no ID. This means that this guy has no profile, thus no data will be stored etc.. As a result the feature now only works partially. It's a safer alternative to leaving it on. If all root causes cannot be addressed, this might be a half-measure solution. Otherwise, yes, this is not an ideal workaround. I'm crossing my fingers, but I believe with the missing moveMilitiaProfiles call added in the if/elseif/else chain, this will cure all errors and writing a 'Clean-Up' method will not be required. Is there any way we can check for a duplicate ID or reference during profile creation? I'v committed some things in r8558. The argument in Strategic Movement.cpp was wrong though (we have to move the profiles first). ResetMilitia() would be rather bad in this case though, as this function causes militia to drop all guns and creates them anew, in new positions, and then arms them. We absolutely don't want that in case they arrive in combat (and it looks a lot better if they arrive on the sector border, the reset would cause them to be all over the sector). MoveIndividualMilitiaProfiles(...) is a bit more effective now, and the relevant warnings only show up once in that file. Not the harsh language thing though. That's kinda important methinks. Currently the only way outside of the code to know what profiles exist is the website. I've disabled this feature (before starting a new game), but Enrico is still sending me emails. If I read one of the emails, I'll get a useless website link, a white page. If I right-click his email to delete it without reading, I just get another one. And another. And another. And another. Mr. Chivaldori turns out to be a spam bot. Is there any way to disable his emails if you're not using this feature? It seems pointless to me that this website is forced upon players that do not use this feature, and I'd like to assume that this wasn't intended. Sweet. Good to go Flug, glad this got fixed.